In 2017, Norway’s best known play turned 150 years. The anniversary was celebrated several places in Norway. It all started in August with The Peer Gynt festival at Vinstra in the Gudbrandsdalen valley. With forests and steep mountains as backdrop, the annual festival took place in the area that inspired the author to write the dramatic play. “Ibsen wrote the play as a 4,5 hour poem, to say to people: what’s the difference between being yourself and being yourself enough”, says Norwegian actor Dennis Storhøi. Storhøi is acclaimed for his many performances as the play’s main character, Peer Gynt. Henrik Ibsen’s play is more than just a tale. It’s a reflection of the 1860’s Norway, a time where many people moved away from the traditional family farms and started a new life in the city. Peer Gynt is also a story of the common man and the challenges and conflicts we all face in life. For that reason, the play is still relevant today. According to Storhøi Ibsen is a genius in the way that he captures the man or the woman perfectly at all times. “He must have had a huge insight in how peoples’ weaknesses and strengths worked”, he says. Edvard Grieg wrote for the play: “Morning Mood”, “In the Hall of the Mountain King”, and “Anitra’s Dance”. Listen to the songs and read more about the artists below. 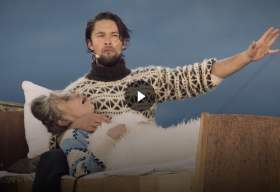 In honour of the 150th anniversary of Peer Gynt, the Norwegian national broadcaster (NRK) produced a documentary about the theatre production at Gålå. You can watch the documentary here (in Norwegian only).